Well it has been awhile since I have worked on these guys, but after coming back from vacation I needed to make sure my skills hadn't gotten rusty and I didn't want to risk messing up a client's miniature, so here he is Sargent Numas. Ironicaly he is actually the first Astral Claw mini I put together, but I was holding off on him until I finished the rest of his squad. Sadly there is still one more marine to go, so I jumped the gun a bit. I am fairly happy with him, mostly the power sword, plasma pistol and banner. 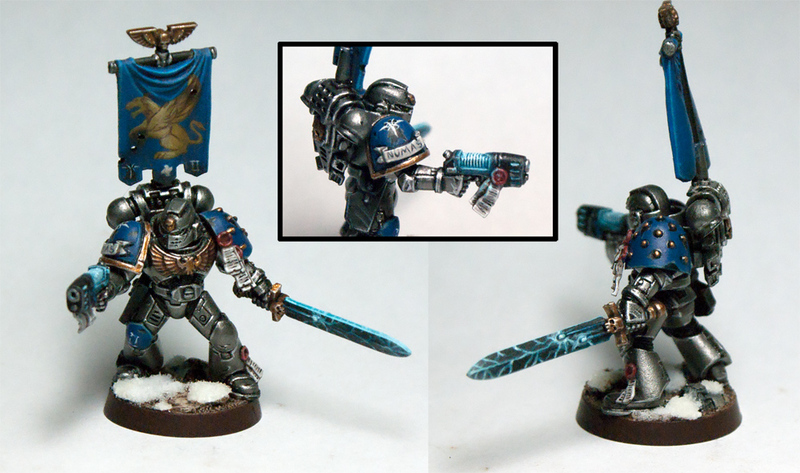 I copied the banner design from the Venerable Dreadnought in Imperial Armour 9. This plasma pistol is the first time I have made the little slots near the muzzle glow as well, I think it turned out pretty well. The only thing I am not super hyped about is the pose. Like I said, he was the first one I assembled and now I feel like he doesn't heally fit in with the grittier poses of the rest of his squad. Although I kind of see him as one of the marines trying to hold onto their more noble past since he is flying the original Chapter symbol on his banner. The pose and knight helm lend to that. I also worked on and finished a Liche Priest for my Tomb Kings which I will post up soon. As always, be sure to vote for him on CMoN here. Amazing work man, the sword looks brilliant! Great job on the mini, especially the banner. Love it. Yeah top stuff mate, I love it. I've actually just primed up one of those banners myself to work on and I like what you did with the freehand.